The AirXY screen is folded into a free standing wall that occupies the center of the exhibit space. 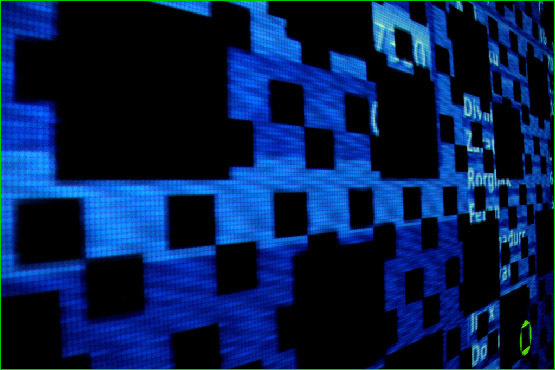 As visitors approach they notice what appears to be a giant checkerboard with a vertical line scanning from left to right. 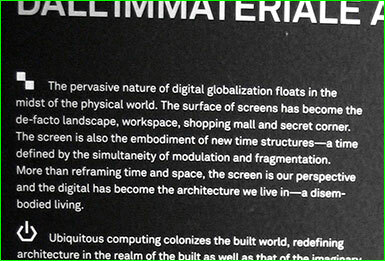 Suggesting the surface of an interface, a desktop and a machine simultaneously, on further observation, the visitors see that the composition is, in fact, charting the passing of time along an XY axis divided into 24x60 units. In addition to the vertical line and rectangular XY units, tiny green abstract icons are floating across the screen, looking like runes, contemporary urban signs or the graphic language of circuit diagrams. Stepping closer to the screen, the visitors are sensed and monitored by overhead cameras. They are captured in real time and transformed into moving forms projected onto the surface. As the visitors step across the floor, their sensed representations may run into the path of an icon, causing a sudden scaling and merging of the icon into the visitor’s form. The longer the visitors remain before the screen, the more they are transformed in real time by the machine, increasingly mutated from humans to abstract traces. 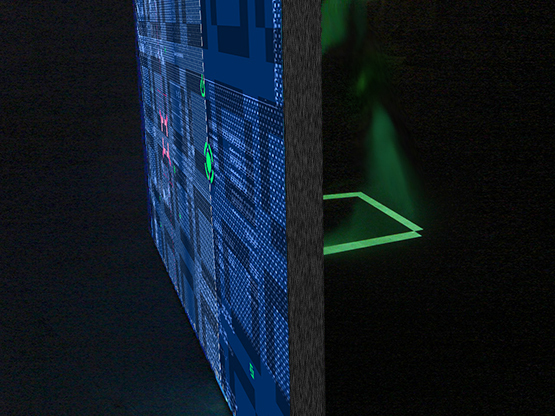 When the visitors walk behind the physical screens they find themselves in a radically different environment. 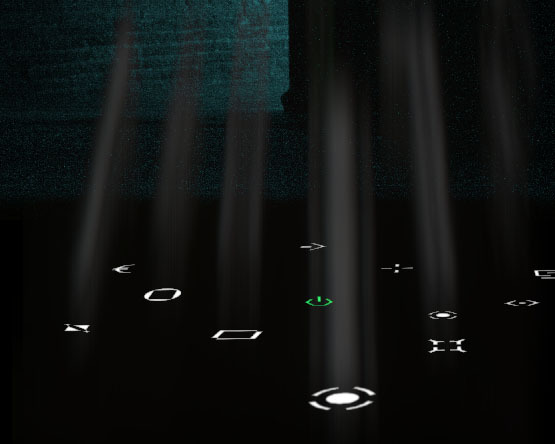 In a darkened world filled with haze, they encounter a series of projected images on the floor, the same graphic icons that inhabit the surface of the screen on the other side. As the symbols gradually appear in the darkness, they now become solid, volumetric forms, created by the interaction of the projected light with the haze. These immaterial shapes appear to breathe in the air space, changing their size and brightness over the course of time and occasionally, appearing at the verge of perception. Every minute, a powerful strobe light flashes, turning the air and the walls around into a green atmosphere for a split second and making the projected architecture disappear into an after image, only to re-materialize moments later. 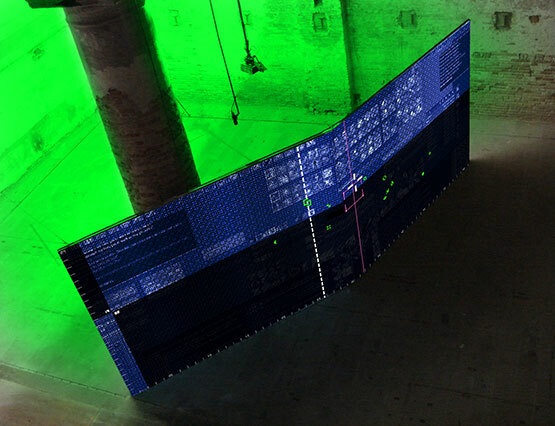 The AirXY front software is written in C++ using the openFrameworks library. The video is captured using 3 infra-red cameras, and is processed using OpenCV and the FreeFrame 1.5 video plugin architecture. 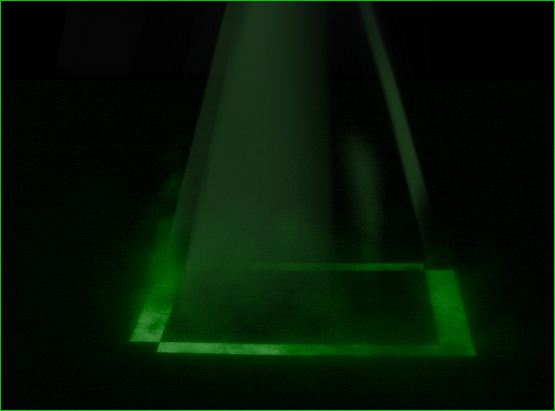 Rendering is done in traditional OpenGL and using GLSL shaders. 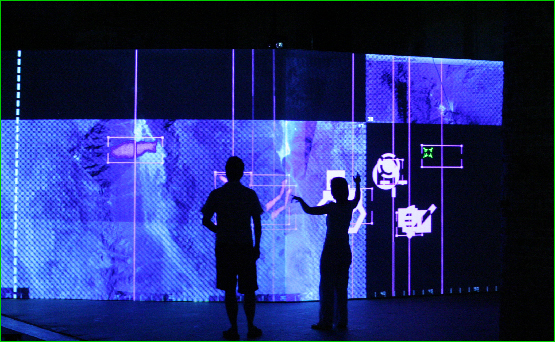 The output image is split and output to 2 projectors for display on the screens. The AirXY front is running on a Mac Pro. The AirXY back software is written in Max/MSP, which controls sound, light and the haze machines. The strobe light, a Martin Atomic 3000 and the hazer are controlled through an Entec USB-DMX protocol converter. This is running on a Mac Mini, which communicates with the front machine through OSC to keep the clocks in sync.